(ISBN 0-441-73122-8)First edition cover art by Paul Rivoche Looking Back: Robot City was one of the first of the modern “borrowed universe” or “apostrophe” series, wherein young writers wrote novels linked to the names or the works of one of the field’s Gray Eminences. (Locus later coined the term “sharecrop novel” to describe such projects.) RC was the creation of book packager Byron Preiss, who developed the outline with Asimov during a series of New York lunches, made the deal with Berkley, and hired the writers (who were then supervised by Byron Preiss Visual Productions staffer David Harris). I was offered the opportunity to write all six books in the original RC series, but I had other prospects (later that year, I signed a two-book contract with Ace that would produce Alternities and The Quiet Pools) and opted only to write the first volume. Copy needed! See Scavenger Hunt page. 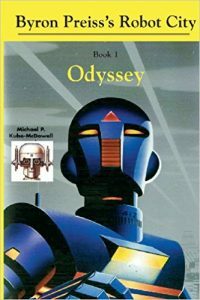 In the late 1990s, the Robot City series reappeared in new editions from Byron Preiss’s imprint iBooks (no relationship to the Apple app). The books were originally released as three 2-in-1 editions in trade paperback (reportedly print-on-demand) and e-book. A few years later, individual mass market editions followed. Both featured new and, to my eye, more dignified cover art. and Book 2, Suspicion, by the late Mike McQuay.